발렌시아, 스페인의 레드 네스트 호스텔 발렌시아 | 호스텔월드에서 예약하세요. 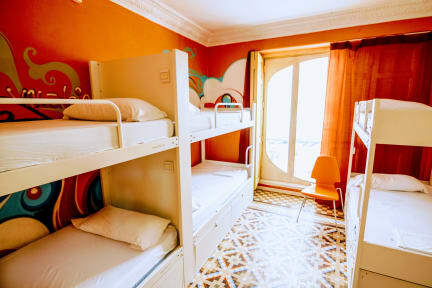 Welcome to the Red Nest Hostel, a cozy accommodation in the historic city center! Our multilingual employees are really friendly and ready to help you discover all that is worth it to see and experience in charming Valencia. You can enjoy the best price of elegant rooms, a large kitchen, free Internet access and magnificent common room with terrace. Traveling alone? No worries, you've come to the right place! Here you will easily meet lots of like-minded travelers from all over the world and have opportunity to share experiences with them and enjoy the city together. Valencia is very much a party city but also has an appealing mix of traditional architecture and ultramodern architecture, making this town one of the most energetic and special cities in the Mediterranean! Furthermore, for only 3 euros, you can buy our buffet breakfast which includes: juice, cocoa, coffe, milk, cereals, toast, sweet ham, cheese, croissant, muffin, jam, butter, seasonal fruit. We also organize various activities such as: free walking tours, pub crawls, paella or sangria evenings and more! - Recently renovated terrace, bar & common area! - New bar with the cheapest prices in Valencia! 진짜 옛날 호스텔. 침대마다 콘센트조차 없습니다 ㅎㅎ 화장실도 별로고 와이파이도 너무 안터지고 가본 호스텔중 최악.